1. Defense will win the Super Bowl. In a season dominated on the offensive side of the ball, I’m thinking that the old adage, offense wins games, defense wins championships, comes through once again. We all know that the three favorites to win the Super Bowl (Packers, Patriots, Saints respectively) can put points on the board, but their defenses are in the bottom 25% in yards allowed per game with the Patriots and Packers being 31st and 32nd respectively. This doesn’t mean I’m completely ruling out any of these teams to win it all, but rather, if these teams are expecting to just outscore their opponents rather then beat them on both sides of the ball, they’ll be in for a rude awakening when they’re losing 19-14 at the end of the fourth quarter. 2. Giants will make a run. I’ve been on the Giants’ bandwagon for some time now, and now it’s time for everyone else to join as well. Eli Manning is playing the best football of his career and has one of the most deadly wide receiving duos in Victor Cruz and Hakeem Nicks. Also, the Giants defense thinks that they can be the best defense in the league and, I agree with them. With the sudden emergence of pro-bowler Jason Pierre-Paul and the return of Osi Umenyiora, the Giants D has really turned it up in the last few games of the season, especially when rushing the quarterback. This could prove to be a problem for opposing teams and definitely makes the Giants a team to watch in the playoffs. 3. Packers won’t win a game. Two words… Drew Brees. Brees is the hottest quarterback in the league and unlucky for the Lambeau faithful, he will most likely be visiting them in a few weeks. Down the stretch of the season, the Packers have looked like they are past their prime, whereas the Saints look like they’re at their peak. In a perfect world, the rest of the playoffs would end when this matchup happens and this would be for all the marbles. However, this is not a perfect world and neither are the Packers. I give the edge to the Saints. 4. No #1 seeds will be in the Super Bowl. As stated earlier, I think the Packers are going to take an early exit on the way to Indy, and the Patriots should be there with them. Let’s face it, Bill Belichick and Tom Brady’s playoff magic has worn off. Along with that, if it isn’t their magic wearing off, it’s their defense. The inexperienced squad won’t be able to last a long playoff run. That combined with the loss of offensive coordinator Bill O’Brien to Penn State should create problems for the Patriots. 5. 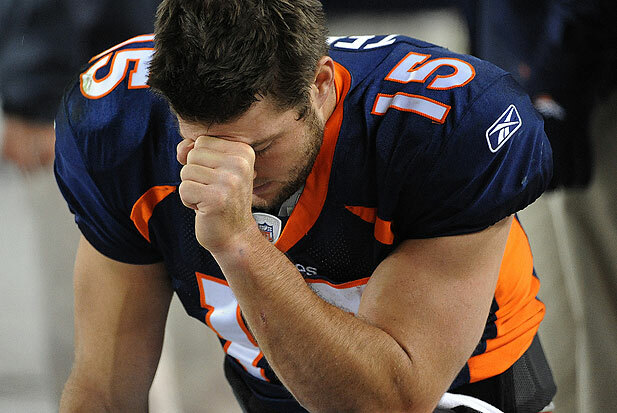 Tim Tebow will make John Elway reconsider the Bronco’s future. All the praying in the world won't help you out in this one, Tim. Once saying that Tebow was “not going anywhere,” John Elway will most likely reconsider this after the outcome of Tebow’s first playoff game. My prediction is that the Bronco’s get destroyed and Tebow’s performance will be horrendous, but it’s not entirely Tebow’s fault… I mean Elway is the one who told Tebow to “pull the trigger.” This advice could not have possibly come at a worse time considering that when Tebow has pulled the trigger in the last two weeks, he has had 1:4 touchdown interception ratio and ending both games with a QB rating under 40. Also, the fact that he’s facing the top passing defense in the league doesn’t help his case at all. I’m thinking Elway doesn’t want him back and is going to try to get the fans behind him by telling Tebow to throw the ball (but this whole scheme that I believe will play out may just come from a Sons of Anarchy hangover). 6. Super Bowl: Saints over Ravens. I’m thinking the Ravens have the lead the whole game, until Drew Brees mounts a late game comeback and outlast the Ravens by a hair. Brees just has way too many weapons (Sproles, Colston, and Graham) to be held down for long. I feel the system that New Orleans has will be too much for the hard nose football the Ravens play. After leading this late game surge, Brees will be named MVP of the Super Bowl, taking home another ring and cementing his name in the record books (for the time being ) all in one season. *all predictions made in this are likely to change. This entry was posted in Football, Home, National, Uncategorized and tagged Football, NFL, Playoffs, predictions. Bold predictions but the games are played on the field and not with the prognostications … we the fans make . That being said I for one hope to see far more entertaining games during the playoffs than we have seen in large part during the regular season !